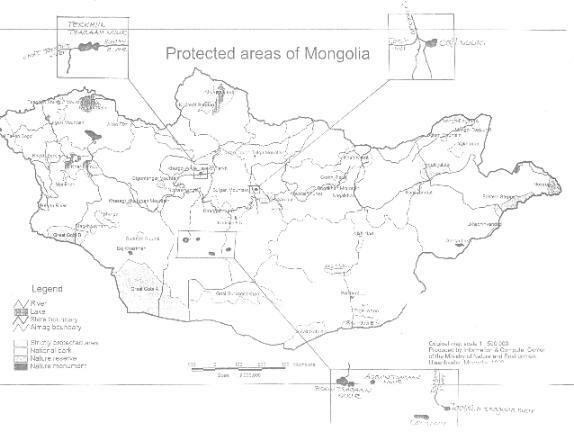 Despite the fact that Mongolia joined the Convention only a few months ago, the Ministry of Nature and the Environment has already submitted three additional nominations to the Ramsar List of Wetlands of International Importance, bringing the total number of Ramsar sites in Mongolia to four (264,220 hectares) and the number of Ramsar sites in all the 110 Contracting Parties to 927 (68,203,343 ha). 1. Terhiyn Tsagaan Nuur (including the Khorgo-Terhiyn Tsagaan Nuur Natural Park). A freshwater and oligotrophic lake formed by volcanic activity, 6,110 ha in size, located in the Suman River valley in the Central Khangai Mountains. As with most wetlands in Mongolia, land use around the lake is restricted to fishing and livestock grazing. About 20% of the lake support aquatic macrophytes and blue-green algae dominate the phytoplankton in summer. The extensive marshes in the west are an important breeding and staging area for migratory waterfowl. The fish fauna is dominated by typically north Eurasian species of cyprinids, pike and perch. The Natural Park was included in the Protected Area System in 1995, and currently has six rangers responsible for its management and administration. An information and awareness centre is being planned within the Park. 2. Valley of Lakes (Boon Tsagaan Nuur, Taatsiin Tsagaan Nuur, Adgiin Tsagaan Nuur and Orog Nuur). A chain of four saline lakes at the foot of the Gobi Altai, totalling 45,600 ha in area and ranging from 1100 m to 1235 m in altitude. The lakes are shallow, with a saucer-shaped depth profile, and vary considerably in size both seasonally and from year to year. As the lakes shrink in summer, they leave areas of salt marsh. These lakes are known to be an important staging area for migratory waterfowl, and it has been suggested that they might be a breeding area for the rare Relict Gull Larus relictus. The lakes provide grazing land for domestic livestock in an otherwise arid region. 3. Ogii Nuur. A 2,510 ha freshwater lake located in the valley of the Orkhon River. It has an extensive alluvial area of grassland, river channels, pools and marshes at the western end and is surrounded by grassy steppe. The maximum depth of the lake is 16 metres, but about 40% of the lake is less than 3 m deep. The lake supports an intensive fishery dominated by cyprinids, pike and perch and livestock grazing. It is a very important breeding and staging area for a wide variety of waterfowl, particularly Anatidae.